Here is the first cousin of Monet's tulips in my garden. I was hoping to give you just a little blast of Spring--the brilliant blue sky after a spring shower, the shocking, vibrant red, yellow, purple of bulb flowers blaring through the winter's end grey, the enthusiastic chirp and twitter of the birds now activated for the season like an army just getting out of boot camp. 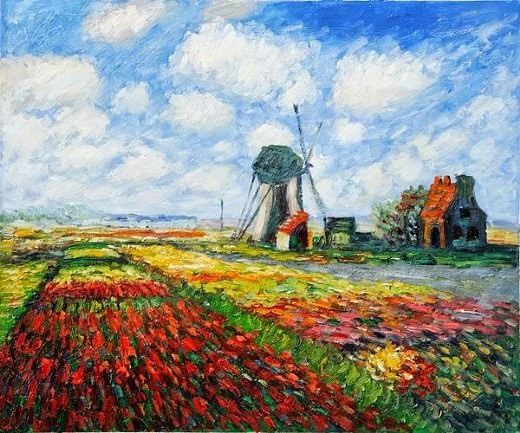 I can just about do it with Monet and Vivaldi--but I can't send you the still-chilly-but-not-freezing breeze on a finally sunny day or the scent of earth unfreezing. You'll have to go outside for that. Wish you could smell these hyacinths!